The tsunami that struck the Pacific coast of Japan, from Hachinohe, Aomori Prefecture to Ibaragi Prefecture, was more than 3 meters high everywhere. It reached 9.5 m high at a deep inner part of the Port of Ofunato. The tsunami devastated many ports, scattering containers and lumber in the storage space of the wharves. Some of them drifted away from shore. Combined with vehicles, ships, and buildings also drifted from shore or moorings, they became obstructions of safe passage in channels and anchorage areas. For disaster-affected areas to receive a great amount of relief supplies by marine transport, supports ships had to be able to come alongside the berth to discharge. Hence the channel clearance works were undertaken and floating wreckage and obstructions in the channel were removed. By March 23, ten major ports became accessible. Channel clearance, which was to remove obstructions in the harbors, began three days after the earthquake. 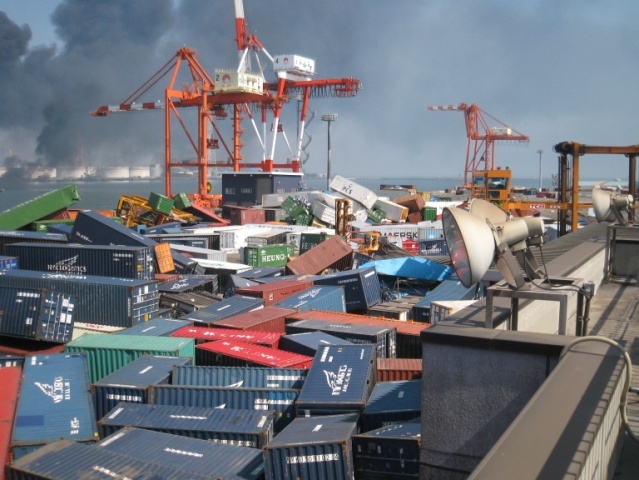 After the tsunami warning and advisory were lifted in the evening of March 13, channel clearance, which was to remove containers, cars, fishnets, etc. drifted from shore or sunk in the sea, began from early morning of March 14. Priority of channel clearance works was given to the Port of Miyako, Kamaishi, and Sendai-Shiogama, the biggest port in Tohoku, because transportation of relief supplies was considered the most important. Clearance works were later expanded to include others major ports. On March 16, the fifth day after the earthquake, a ship with emergency relief supplies on board entered the Port of Kamaishi. By March 23, temporary safe channel had been secured in ten affected ports, allowing the ports to receive emergency relief supplies by marine transportation. On March 21, the tenth day after the earthquake, the first oil tanker entered the Port of Sendai-Shiogama, relieving the shortage of fuel oil.